The Total Solar Eclipse of 4 December 2002. The narrow blue region is the Path of Totality (also known as the Umbra). The umbra shadow travels from west to east (left to right on the map). At the point of Greatest Eclipse, totality is at local midday. The duration of totality at greatest eclipse is 2 minutes 4 seconds. This occurs in the Indian Ocean. On either side of that point, the duration is less. To the West of greatest eclipse the eclipse will be total before local noon; East of it, totality will be seen after local noon. The umbra is widest around the time of greatest eclipse as the Earth is bulging out towards the Moon in that region. The area on either side of the path of totality (in pale blue) will provide a partial eclipse, the magnitude decreasing with distance from the path of totality. Beyond that no eclipse is visible. The Sub-solar Point is the location where the Sun is overhead at the time of greatest eclipse; this point is well South of the equator in December. The parts in red are the regions where the eclipse occurs during sunrise (left) or sunset (right). The path of totality begins in the southern Atlantic Ocean, crosses southern Africa, the Indian Ocean, ending in southern Australia. The umbra takes 3 hours 21 minutes to traverse its entire path. 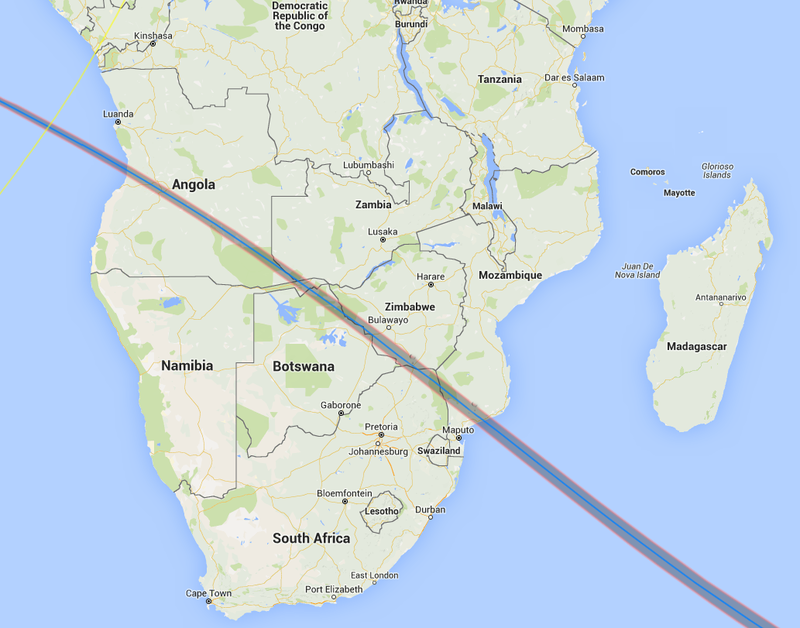 The Path of Totality is the dark band moving across Africa from left to right. In this part of the path the eclipse occurs before local noon. The path travels across Angola, part of northern Namibia, Botswana, southern Zimbabwe, northern South Africa, and Mozambique. It takes about 30 minutes for the Umbra to cross Africa. The Umbra becomes more circular from left to right as the meeting between the Earth and the umbra becomes more perpendicular. It is also getting wider as the Earth is curving closer to the Moon. 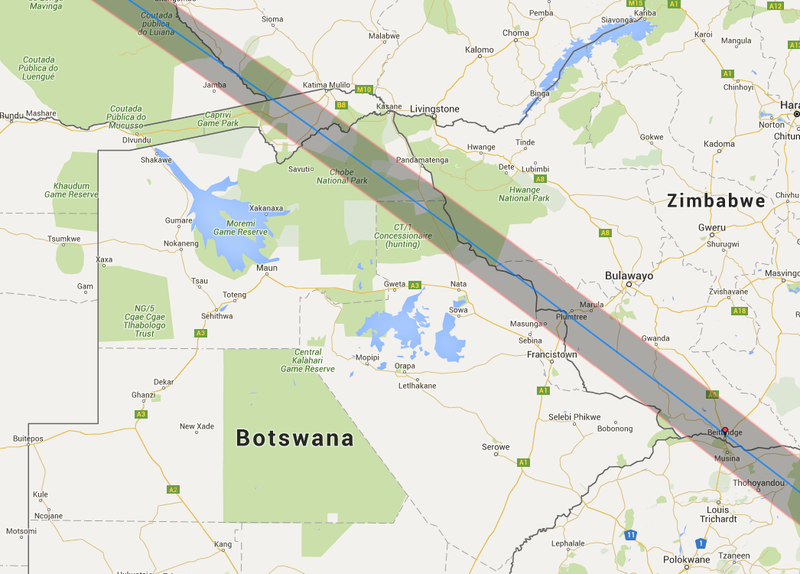 The Path of Totality is the dark band moving along the Botswana-Zimbabwe border (zagged grey line) from left to right and top to bottom. The Centre Line of the eclipse in in blue. The duration of totality is at its maximum along this line. The two outer red lines are the Path of Totality and the red line along the middle is the Centre Line. The maximum duration of totality is found along the centre line. The jagged grey line running from top to bottom is the border between Botswana and Zimbabwe. 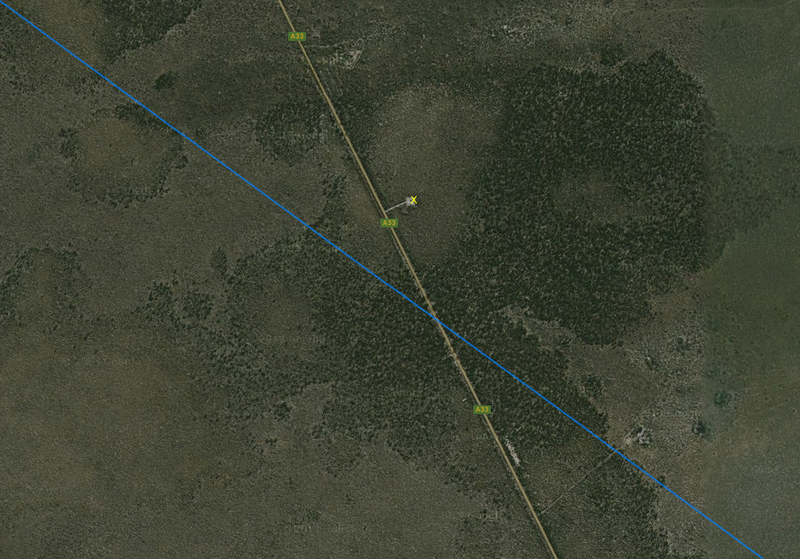 The yellow line running parallel to the border is the Kasane to Nata Road in Botswana. The Umbra at this point is elliptical. Its maximum length is 108km. It is 62km wide. The ellipse is moving at an angle so the Path of Totality is 70km wide. This is fairly narrow. The eclipse site was at the intersection of this road with the Centre Line of the Umbra. The eclipse site (marked with a yellow X) is a small clearing on the side of the otherwise featureless Kasane to Nata Road. The location was about 500m from the Centre Line (blue). I navigated the safari jeep to this location using a Garmin GPS 12 Personal Navigator. The Location, Latitude, Longitude and Altitude (in metres) are for the observation site. The latter three figures were measured on a Garmin GPS 12 Personal Navigator. 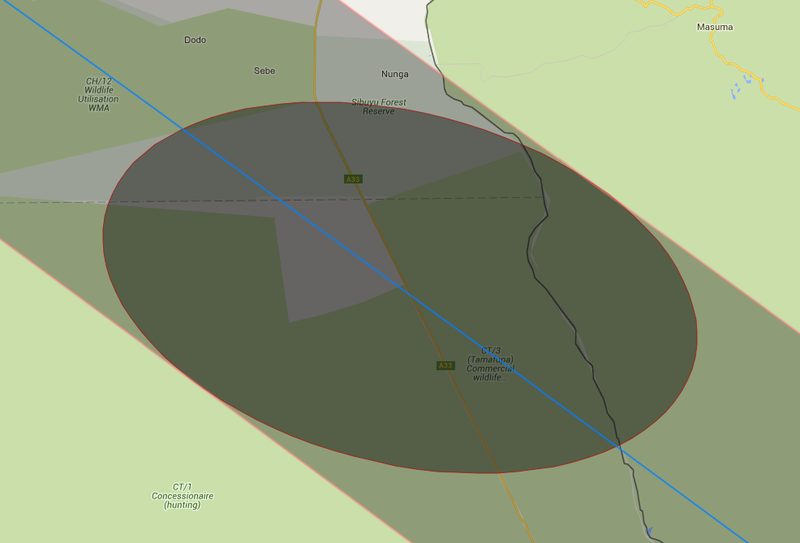 The Distance from Centre Line was estimated using a map with the path of totality plotted from Fred Espenak data. First Contact is the beginning of the eclipse when the first "bite" appears on the Sun's disk; it is the beginning of the partial phase. Second Contact is the beginning of totality. Third Contact is the end of totality. Fourth Contact is the end of the partial eclipse. The times are in local time which, for this eclipse, is UT + 2 (GMT plus two hours). The Duration of the eclipse at the observation site was 1 minute 14 seconds. The Path Width is the width of the path of totality. The umbra itself is elliptical in shape. The Major Axis is the longest axis of the umbra; the Minor Axis is the shorter axis. The umbra at the observation site was 108km long and 62km wide and produced a path width of 70km. The path width was small enough to make the eclipse brighter than average. The Direction of the Shadow indicates that the umbra approached the observation site from the North West. The Umbral Velocity was the speed of the Moon's shadow (1.44 kilometres per second) at the observation site. This and the umbral width determines the duration of the total eclipse. The Position Angles indicate the exact position of the Sun's disk where the Moon covers and uncovers the Sun at the beginning and end of totality. Gamma determines how the Moon's shadow, if extended, would pass through the Earth. A Gamma of zero implies that the shadow would pass through the exact centre of the Earth. A Gamma of greater than 1 misses the Earth and no total eclipse would occur. A positive Gamma passes North of the Earth's centre; a negative Gamma passes South of the Earth's centre. The value of Gamma for this eclipse is -0.30204. This means that the shadow passes South of the Earth's centre, about a third of the way to the edge of the Earth. This, combined with the fact that in December, the Southern Hemisphere is tilted towards the Sun, produces an eclipse in the Southern Temperate Zone. The Diameter Ratio determines how much bigger the Moon's apparent radius is than the Sun's. In this case, the Moon's radius is 1.0181 that of the Sun's. A total eclipse can only occur if this figure is greater than 1. The Moon would then appear larger than the Sun and could cover it completely. It is a smallish figure so the total eclipse is not of long duration. If this figure was less than one a total eclipse could not occur because the Moon would appear smaller than the Sun. The Obscuration determines how much larger the Moon's apparent area is than the Sun's. The Saros is a collection of eclipses belonging to a series. Each member of the series is followed by a similar eclipse approximately 18 years, 11 days and 8 hours later. This eclipse is a member of Saros number 142. It is the 22nd eclipse out of a total of 72 in the series (28 partial, 43 total and one hybrid). The first eclipse of the series was a small partial eclipse in the southern polar regions on 17 April 1624 and the last will occur on 5 January 2904 at the northern pole. On 28 May 2291, this series will produce a total eclipse 6m 34s long. Saros 142 will last for 1280 years. The 2002 eclipse main page. Maps of the path of the 2002 eclipse from Fred Espenak and eclipse details at the observation site. A photo of the camping safari group. The excitement during totality is such that not all photos come out as expected. Accounts of the 2002 eclipse sent to this web site are reproduced here. A map of the three week safari route. The story of how Kryss arranged the CampWild camping safari for this eclipse over the internet.